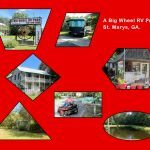 Ask fellow campers about "A Big Wheel RV Park" and nearby attractions. A lovely, small, well maintained campground with winding roads and live oaks draped in Spanish Moss. We arrived after the office closed, so were told to just take our site when we got there, which we did. No resort folderol here - just a nice, quiet campground full of pleasant people. Our concrete slab site was level and the utilities were convenient. The staff was very helpful. We found an excellent dog sitter who lives in town, you can get her name at the office. We camped at A Big Wheel RV Park in a Motorhome. Very close to passenger ferry to Cumberland Island National Seashore. Half hour drive to Okefenokee Swamp. 1 hour drive to Jacksonville. St. Mary's waterfront is lovely. Submarine Museum worth the time and money. Place hasn't changed. Been here before and it's always been good. Rained here pretty hard the evening we arrived but the area drained quickly and all is good. Front office friendly and helpful. Park is convenient to down town St Mary which is a very nice little town and worth a visit. Our 2 night stay went well, as usual, and we will return again. We camped at A Big Wheel RV Park in a Fifth Wheel. St Marys is a great little country town, almost quaint. Love the water front area. Had site number 1 - very nice concrete pad across from the rest rooms, showers and awesome laundry. The park is clean and well kept with a beautiful canopy of trees and Spanish moss over the sites. The owner was very nice as well as her staff. They know the area well and were helpful with information and the history of St Marys. We stayed for 6 days and were really able to relax. We will stay with them again and highly recommend anyone in the area to stop for a few days and take in St Marys. It's a very historic town. We camped at A Big Wheel RV Park in a Motorhome. Please visit the Submarine Museum in down town St Marys. They are working very hard for our veterans and keeping the memories of our silent service members alive. The live oaks are amazing and the war of 1812 museum is a must see. Of coarse Cumberland Island should be on your list of things to do. We stay at A Big Wheel often. The park is clean, quiet and peaceful. The staff is friendly and helpful. We camped at A Big Wheel RV Park in a Motorhome. It is close to a variety of activities in the St Marys, Fernandina Beach, Fla area. This campground is a quiet gem. Friendly and helpful owner and host. The rows are paved and that is nice to keep the sand out of your camper. The park is tidy. Very good Wi-Fi experience in site no. 1. We camped at A Big Wheel RV Park in a Motorhome. Big Wheel is a good location to visit the charming town of St. Mary and the ferry to Cumberland Island. Fernandia Beach and Amelia Island are convenient to the campground too. The campground is located very near Crooked Creek State park. You can ride a bike to the park which is delightful to stop in the Nature Center. Stayed four nights. We had a concrete pull-through site with a patio and picnic table. Somewhat more space and privacy than a lot of similar parks. There was a lot of space inside the park that was not used for RV parking and lots of trees and native plants. Also a number of small fields and a pond. Great for the dog. Yes there were couple of roosters, and they did start crowing about 4:30 AM. If you are a light sleeper you might need earplugs. The owner was very helpful and friendly. No cable TV. We would definitely stay here again. We camped at A Big Wheel RV Park in a Motorhome. This Park has a great location. Close to Amelia Island and Fernandina Beach, the Okefenokee national wildlife refuge and Cumberland Island. We visited all three and they were great, especially Cumberland Island. This is a nice clean tropical feeling RV resort. It is not a campground. Office staff was friendly. People staying in the park were great! All hookups worked well. Sites are a little close together and no privacy between sites. We didn't use the showers but from what I saw they were clean and safe. There are some very tight turns in this campground. Easy to find. Would definitely stay here again. We camped at A Big Wheel RV Park in a Fifth Wheel. We stayed at this park for a week and had a fantastic time. The park is clean and the staff is friendly. The only complaint I had were the roosters! The park has free-range chickens, and the rooster starts crowing at about 4 am and doesn't stop until the sun comes up. Sleep with a fan by your head or bring some ear plugs, because I was woken up early for the first few days. Our dogs loved the fenced in dog park at the back of the property. They could run around and play off leash, which was very nice. The laundry and the restrooms were very clean, and we had no problem getting packages delivered to the park. There is a small bar just steps away from the park. We went there one night and met the locals and got some great recommendations about what to do in the area (which I will share with you in the tip section!) We camped at A Big Wheel RV Park in a Fifth Wheel. We had a fine time in this area. DO NOT MISS CUMBERLAND ISLAND! We took the 11:45 ferry out and the 4:45 ferry back. This was plenty of time to see the Dungeness Ruins and walk the beach. If it had been warmer, I would have taken the earlier ferry and spent all day on the beach. It really was breathtaking. An overnight stop for traveling I95, we have used this campground before and like it. Always prefer to use the Passport America parks rather than Walmarts, truck stops, etc. whenever possible. Nice people run the park and the sites are level concrete while interior roads are asphalt and nice. We camped at A Big Wheel RV Park in a Motorhome. Very friendly office staff. Passport America rate. Spent 1 night just passing thru. Would consider this park for a longer stay. Transient sites are about 65' long. Tree branches need trimmed. Wifi worked well for FB and email. Picked up a couple antenna channels. Water pressure was fine. Roosters crowed a bit early. A fee park cats visited, but were not a nuisance. Exiting may require big rigs to take a tour of the park to get out. Some turns are tighter than others. We camped at A Big Wheel RV Park in a Fifth Wheel. This CG is well off the beaten path. The roads are paved and the sites are concrete. The roads are narrow and even though we requested a pull through for 1 night, we had to disconnect. The layout would not allow me to pull into my site with my tow. The wifi was very weak even though we could see the antenna. This park is NOT big rig friendly. There seemed to be a lot of long termers and they were not very friendly. Although there is a Passport America members sign, we did not get a discount. We camped at A Big Wheel RV Park in a Motorhome. Easy to find and easy in and out. Paved inner roads. Pull Thru was FHU with level concrete pad with patio. Wide and long enough for our 40' motorcoach with a tow and two slides. Mature trees and shrubbery between spacious sites for privacy. Patio area with picnic table. Nice areas to walk dogs. No litter, trash or dog waste. Nice responsible pet owners who pick up. Pond with fountain and catch and release. Great way to unwind from a day on the road or from sightseeing/eating/shopping in St. Marys. Loved the free range chickens and had no problems with crowing that others have mentioned. Maybe our rig is better insulated. We heard there is a great pot luck on the weekends and card games during the week for those who love to meet others and swap stories. Whether you like that, or you just want to chill out, the campground is wonderfully relaxing and peaceful. You won't regret giving them a call and staying here. We will be back again. We camped at A Big Wheel RV Park in a Motorhome. Wonderful hosts....fells like home...enjoyed a great potluck supper on Sunday night.... Highly recommend. We camped at A Big Wheel RV Park in a Truck Camper. We had a fine time in this area. DO NOT MISS CUMBERLAND ISLAND! We took the 11:45 ferry out and the 4:45 ferry back. This was plenty of time to see the Dungeness Ruins and walk the beach. If it had been warmer, I would have taken the earlier ferry and spent all day on the beach. It really was breathtaking. The park is a great home base for visiting Georgia's coastal islands and Florida from Amelia Island to St. Augustine. Okefenokee NWR is about an hour away. Walmart and two grocery stores are a 15 minute drive. Jacksonville has everything. Good variety of affordable restaurants in Kingsland/St. Marys. This park is conveniently located from I-95 (about a 10 minute ride). All shopping and convenience stores are about 5-10 minutes away. Downtown St. Mary's, GA I describe as walking into a Norman Rockwell painting. It is a charming harbour town. Fernandina Beach is less than an hour away. Beautiful beach, great restaurants, plenty of varieties of boats to charter in all price ranges. We paid $28 each for a 2 hour sunset cruise that took us around Cumberland Island and down the coast past Ft. Clinch and the state park. It was BYOB and had live entertainment. Dogs were welcome so our Murphy had his first sea-going experience. Great fun! Jacksonville, FL and Fernandina Beach are 45 mins. Okeefenokee swamp is an hour away. Savannah, GA is 100 miles. There is a state park practically across the street, beaches are nearby and pretty old downtown St Mary's. Are you affiliated with A Big Wheel RV Park ?